Our Sugar & Spice Captured Wish makes a great gift for baby shower moms who are (or will be welcoming) a new baby girl into their life. Sugar and spice and all things nice, as well as heartfelt love, care and attention to detail have gone into this beautiful, delicate wish vessel that's gorgeous beyond any doubt. We'll even add the baby's initials! We all remember the old verse about Sugar and Spice and All Things Nice! That's where the inspiration for this beautiful baby shower gift came from. No mom-to-be will be unmoved by the fragile beauty of this charm-decorated wish vessel, filled with love and best wishes. 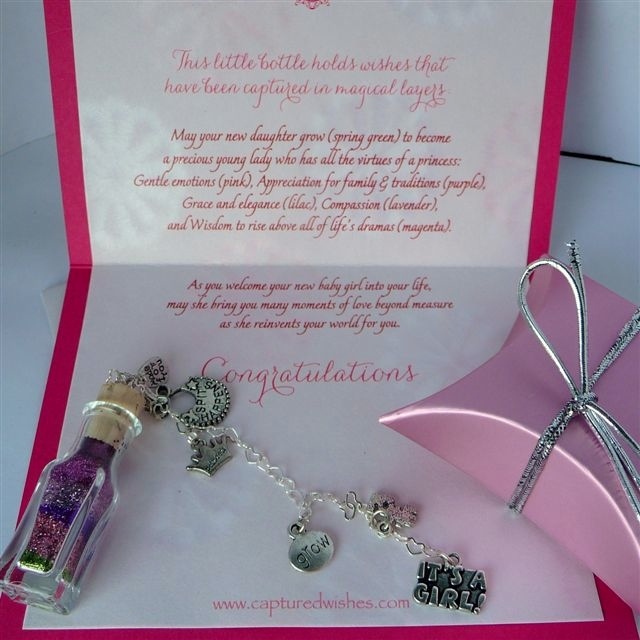 This is definitely a unique keepsake gift designed especially for baby girls! Each Captured Wish vessel comes in beautiful custom packaging and includes an AWEsome verse card which puts the thoughts and emotions you have trouble expressing into words for you. All moms have wishes for their daughters to make all the right decisions; all those who see and hold this gift will be amazed and delighted by the sentiments this gift expresses - they're sure to demand to know where you got it from!